Easter weekend was pretty hard for me. I was surrounded by so many of the people I love. It was a beautiful weekend of joy and celebration. But at the same time, it was devastating. Thinking that I probably shouldn’t even have been up in PA, considering that Joanna could have been born early. Or, better yet, that she was growing and healthy and happy right up until 40 weeks: Tuesday. Which would have meant I couldn’t have traveled so far away for Easter. Those are the things I think of when I’m alone, when I’m in bed trying to fall asleep, when I’m driving in my car… If only things were different. 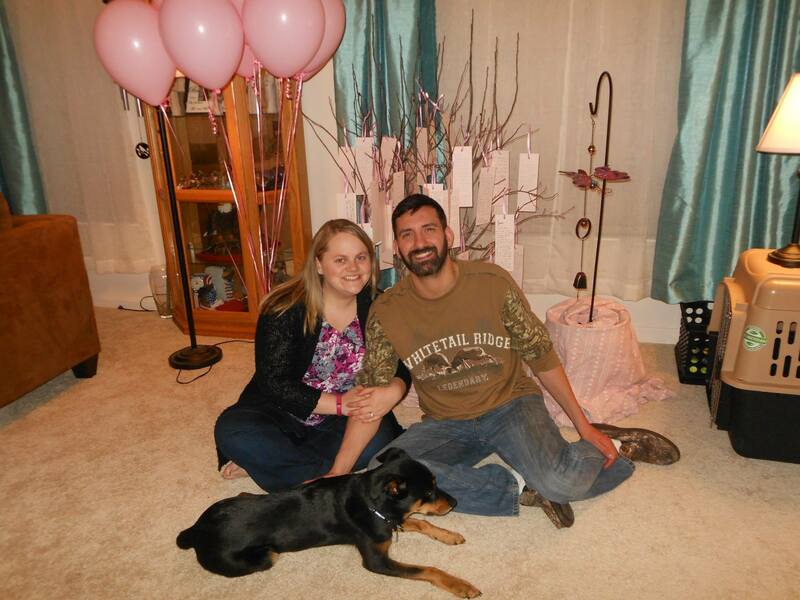 Speaking of 40 weeks, Tuesday on my due date we had a celebration of Joanna’s life. We decided to plant a winterberry bush in our backyard. It will get bright red berries in December (her birthday) and will have bright green leaves most of the rest of the year (that come out in Spring, around her due date). 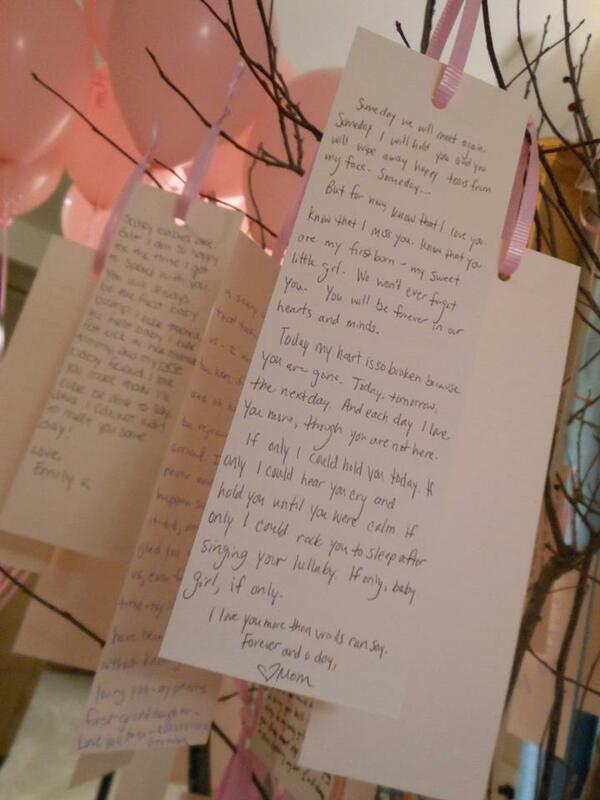 Prior to the evening of our celebration, we invited friends and family from afar to write “Dear Joanna” letters on tags that I designed and printed on light pink card stock. Then, local friends (and my mom and Aunt Barb) came over for a potluck dinner Tuesday. April 7. We hung all the mailed-in tags and the friends who could attend the celebration filled out tags and hung them as well. We had wanted to plant the winterberry and hang the tags outside, but the weather was not cooperating. I was pretty upset at first. Something came out of my mouth in the car on my way home from work that sounded like, “God, You get to have Joanna, can’t I at least have nice weather for our memorial?” And it came out in a loud, angry yell. It was certainly a low moment for me, though anger is a common emotion for me to feel when I think about losing Joanna. Regardless, I felt better after saying what I was truly feeling, and a bit of peace washed over me, like God was answering me, “You carry Joanna in your heart, you celebrate her life every day, the weather can’t change that, or how much you love her.” And so I went home, put the tree in the house like a Christmas tree and we celebrated. It was beautiful. The pink really popped, plus we had pink tulips and pink balloons. I feel so blessed to have so many family members and friends who joined us in celebrating, near and far. I am so grateful for their thoughts and prayers and support during the past three months. There is no doubt in my mind how loved Joanna was and still is – and no doubt that Bill and I are loved, as well. A final thought…I feel like making it to my due date and surviving this time is a huge relief to me. Every week I thought about how far along I would be in my pregnancy and what that would mean for us. And now, I am not counting down to the day when my baby would NOT be born. It has passed. I am here. Breathing. Sure, I will think of all those milestones we are missing as the rest of the Spring babies are born. I will be happy and sad all at the same time to see new pictures of those babies on Facebook and even meet some of them once their parents bring them home and are settled. But now, we’ve made it. Now, we look back with love and sorrow all at once. But now we also look forward – and try to hold on to hope that someday there will be a baby brother or sister for Joanna. We look in our hearts and we find her there.